Dr. James Triant is passionate about preserving teeth and making his patients equally passionate about their own oral health. He takes on the most difficult cases, stating that he joined the healthcare field to help those in need, and dentistry, in particular, because he enjoys working with his hands. Dr. Triant’s unique background enables him to bring the principles of both biology and engineering to his work. Dr. Triant completed his undergraduate training at the country’s premier technological institute, the Massachusetts Institute of Technology (MIT), where he earned his Bachelor of Science degree. He continued on to dental school at Columbia University School of Dental Medicine, earning his Doctorate of Dental Surgery, and completed an internship at the Brockton, Massachusetts VA Hospital. Each year, Dr. Triant registers for a number of continuing educational courses, including cutting-edge training with CEREC®. 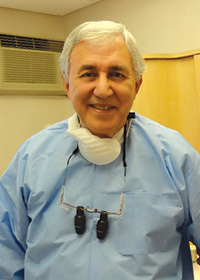 Dental techniques are continually improving and he wishes to provide the most up-to-date treatment for his patients. Personally, Dr. Triant has taught many dental students who are now practicing dentists: he served for many years as a clinical instructor in prosthetics at the Harvard School of Dental Medicine while also maintaining his private practice. In addition to his memberships, Dr. Triant served for 20 years on the Massachusetts Dental Society’s Council for Dental Care and as chair of the dental peer review committee for Middlesex County.